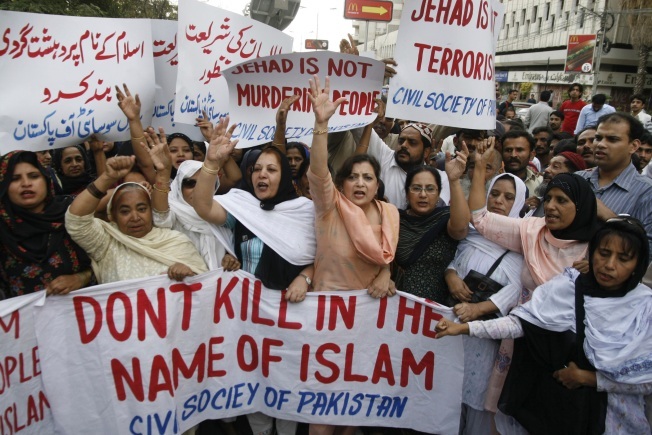 Pakistani women rally against Taliban and Islamic militants in Pakistan earlier this month. ISLAMABAD — The Taliban announced a 10-day cease-fire in Pakistan's Swat Valley on Sunday after freeing a Chinese hostage during peace talks with the government, while an abducted American threatened with imminent death by his kidnappers remained missing. Past peace deals with militants, including in Swat, have failed. Any agreement this time could spark renewed U.S. criticism that peace talks merely give militants time to regroup and rearm. Taliban spokesman Muslim Khan called the release of Chinese engineer Long Xiaowei a goodwill gesture as government officials and Taliban sympathizers said they had come to terms on introducing elements of an Islamic judicial system in Swat and surrounding areas. "In view of these developments, we announce a unilateral cease-fire for 10 days, but we reserve the right to retaliate if we are fired upon," Khan told The Associated Press. The Swat Valley was once a tourist haven and is now believed to be mostly under control of the militants, who have long demanded imposition of Islamic, or Shariah, law. Regaining Swat is a major test for Pakistan's shaky civilian government because, unlike the semiautonomous tribal regions along the Afghan border where al-Qaida and Taliban have long thrived, the valley is supposed to be fully under its control.